We have seen what Shang Simla in China has in store with us. 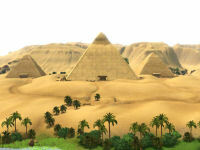 It is now time to visit Al Simhara in Egypt to find out what the desert sands are hiding. As well as looking at the landmarks, we will be finding out from a different sim about adventuring, learning photography and also how to succumb to - or avoid - mummification. Written at 23:00 on Tuesday, 25 May 2010 by Andy.